A rather inconspicuous little orchid, 4 to 10 inches high with tuberous-fleshy roots. 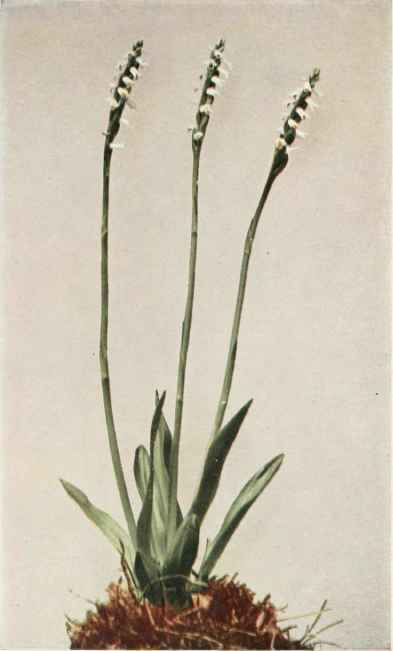 Leaves three to five to a stem, mostly near the base, lanceolate, 2 to 5 inches long. Flowers spreading in a dense, terminal spike, 1 to 2 inches long, one-third to one-half of an inch thick, each flower about one-fourth of an inch long; petals and sepals white, the lateral sepals free, narrowly lanceolate, the upper sepals somewhat united with the petals; lip pale yellow on the face, oblong, not contracted in the middle, the wavy apex rounded, crisped or fringed, the base short clawed, bearing mere traces of callosities at the base. Moist banks, meadows and bogs, Nova Scotia to Minnesota, south to Virginia and Wisconsin. Flowers in June and July. The most showy species of Ladies'-tresses is Ibidium cernuum (Linnaeus) House (figure X), which is 6 to 24 inches high and pubescent above. Leaves mainly toward the base of the stem, linear-lanceolate or linear, 3 to 14 inches long; flowers very fragrant, white or yellowish, forming a spike, 4 to 5 inches long and one-half to two-thirds of an inch thick; flowers spreading or nodding, each about five-twelfths of an inch long in three rows; lip oblong or ovate, rounded at the apex, crenulate or crisped on the margin. Flowering in late summer and autumn. 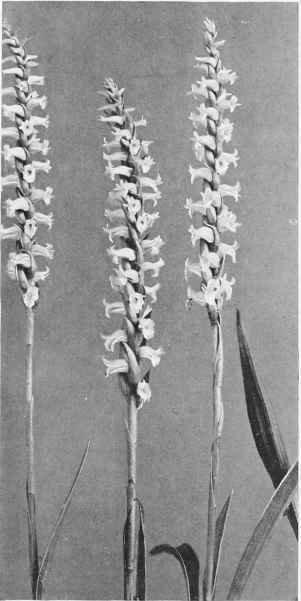 Another common species of Ladies'-tresses is Ibidiumstrictum (Rydberg) House, perhaps only a race of I bid -iumromanzoffianum, which has the sepals and petals coherent and connivent into a hood. It is common in bogs and swamps during July and August.